Alameda, Lake Oswego, Eastmoreland, and the like. They enjoy a long-term cycle of repeat business and referrals. But the rainy off-season, especially in January and February, has always been a problem. Instead of going to someplace sunny for a couple months and ‘forget about it,’ Sundeleaf contacted MKTX for recommendations to keep busy. MKTX proposed and executed a plan to heighten awareness online, in the mailbox, on the coffee table, and hanging in the kitchen. To feed prospects’ imagination as to the beauty of the painting job they could have, we created a custom calendar showcasing the company’s work at these elegant homes, distributed in December. In addition to acting as a “wish book” for prospects, the calendars were a durable reminder to the company’s existing clients of the good job they could have the next time they need painting done. To appeal to clients’ “pain,” we produced advertising and direct mail campaigns dramatizing the greatest concerns in hiring a painter. For example, one concept showed a detective responding to a Missing Painter Report. 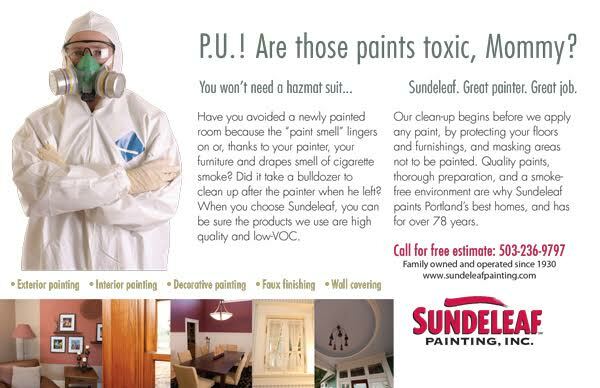 Another showed a customer in a hazmat suit avoiding contact with harmful painting materials, and a third showed a racehorse in magenta blinders as a way to dramatize how Sundeleaf’s clients and their guests won’t need blinders to avoid seeing painting mistakes. The ads went into publications such as The Multnomah Athletic Club magazine and the mailers went to upscale Portland neighborhoods. 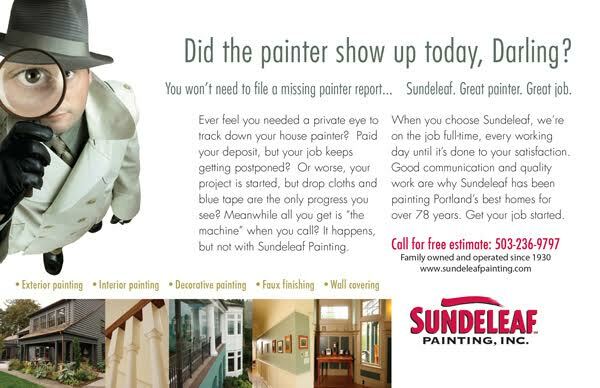 The “bad painter” campaign we did is an example of how an advertiser can communicate an image of confidence and competence in a fun way. Joe is a playful conceptualizer whose insights and creative leadership have assisted dozens of Northwest high technology and industrial enterprises. He toured the country with theater companies in principal roles as a child actor, received a classic prep school education, and after a dual major in science and English at USF, operated a California cattle ranch for two years before returning to complete his education at UP and settling in Portland. Joe's experience includes four years at Tektronix as their first creative director and corporate advertising manager. He went on to hold creative director positions at ad agencies Santana & English, Ltd., The Technology Group/Advertising, EvansGroup, and B/E/S/T Advertising, where his creative campaigns helped sustain three years of 30% growth for Tek's $600 million color printer division prior to its purchase by Xerox. He joined MKTX in 1999. Every Friday he suits up with a bow-tie and drives his 1940 Packard convertible.